~ Linda Pastan, from "The Months"
Does anyone else feel as though summer is whirling past the window of a speeding train - one that stubbornly refuses to slow down long enough to take in the scenery? Seriously, how can it possibly be the end of July? It's ridiculous. I'm buying fruit, every kind of fruit I can get my hands on, as if stashing strawberries in my fridge will confuse August enough to keep it at bay. Pies, in case you haven't noticed, have become an obsession lately. I love the tedious process of preparing a crust - watching flour, butter, and sugar come together to form a flaky deity is sheer baking alchemy. And even though I'm still anxious about rolling out pie dough, it's the most beautiful form of self-doubt and anticipation. This was an unintentional lattice. The top crust was supposed to have been one large unit with a few rustic vents slashed through the center and a drizzly glaze of vanilla, cream, and confectioners' sugar. I think the residual heat from last week made my work surface extra moody (me too, possibly). Prepare the crust: In a large mixing bowl, whisk together the flour, salt, and granulated sugar. Add the cold butter cubes and mix until evenly coated. Place everything into the bowl of a large food processor. Using several short bursts, pulse until the mixture resembles cornmeal (it will look very dry). Transfer the mixture back to the large mixing bowl and place the bowl into freezer. Freeze for about 30 minutes. Just before you're ready to roll out the dough, prepare the filling: In a large mixing bowl, combine the berries, sugar, cornstarch, lime zest, and lime juice. Stir until everything is well combined; Set the bowl aside. Preheat the oven to 375 F. Butter a 15x10x1-inch rimmed baking sheet and line the bottom with a sheet of parchment paper. Remove the larger half of dough from the refrigerator. If it's too hard to roll let it sit at room temperature for a few minutes. Flour a very large working surface and roll the dough out into an 18x12-inch rectangle. This will seem almost impossible at first, but keep flouring the counter (and the rolling pin) and rotating the dough - it will stretch. If you think the dough is getting too warm, gently roll in onto the rolling pin and unroll it onto a large, flat, parchment-lined cookie sheet - refrigerate until the 'stickiness' goes away. Once the dough is completely rolled out, place it into the prepared 15x10-inch baking sheet, allow the edges to hang over the rim. Pour the cherry filling over the dough - spread it out into an even layer; Set aside. Once the lattice is in place, trim the edges and fold the bottom crust over the lattice strips - pinch them together to seal and then fold the crust neatly into the sides of the rimmed pan. Brush the crust with the beaten egg and sprinkle two Tablespoons of sugar (use more sugar if desired). Bake the pie for 45-55 minutes, or until the crust is golden brown and the filling in the center in bubbly. Rotate the pie half-way through the baking period. Remove the pie from the oven and place onto a cooling rack. Cool completely before slicing. Marvelous! 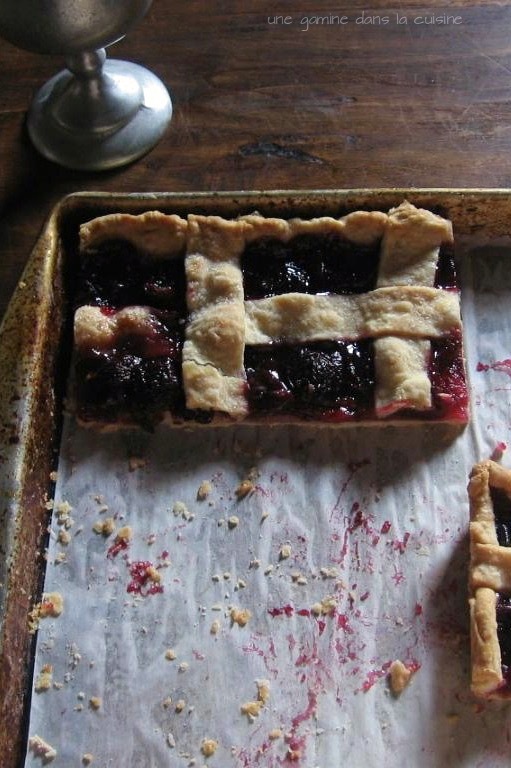 This pie would be perfect for taking on a picnic. Beautiful post and a beautiful slab pie! Now please tell me you saved me that corner piece - I think it has my name on it ;). I love the slab pie idea. It's so much more inviting - both for the cook and people enjoying it - than a traditional pie. More rustic and less prim and proper and I love that. This is stunning! I hate thinking July is almost over..beautiful pie. I've been on a pie kick too, but sadly haven't been able to find cherries at a price I'm willing to pay. I keep hoping they'll go on sale :) Anyway, this pie looks fantastic, there's something about a slab pie I can't resist! Oh yeah, chika chika! This pie is beautiful!!! I am doing the same thing with summer's produce...I have two enormous boxes of fruits and veggies I picked up at the farmer's market today. I don't even want to think about winter!!! I was just thinking that summer was sailing by WAY too quick. Why though? I wish time would slow down. Smile. I am SO loving this slab pie - so unique yet so beautiful and I can only imagine how tasty. This is a must make! What a lovely way to prepare a pie. And I completely agree, one can never use the bounty of summer fruit fast enough. Or thoroughly enough.. Gorgeous post, both in word and photos!! that looks wonderful, I love cherry pie! This is just.... beautiful! Gorgeous looking pie. Pity that cherry season JUST ended for us. Bookmarking for some other stone fruit though. LOVE it! I don't know if there's anything in the world that's better than cherry pie. Yours looks magnificent. Pie perfection!! I love the word "slab", especially when we're talking pie. Summer is flying at a super scary pace! I can't stop buying more fruit than I need at all times and will definitely go into panic when blueberries are no longer in season. 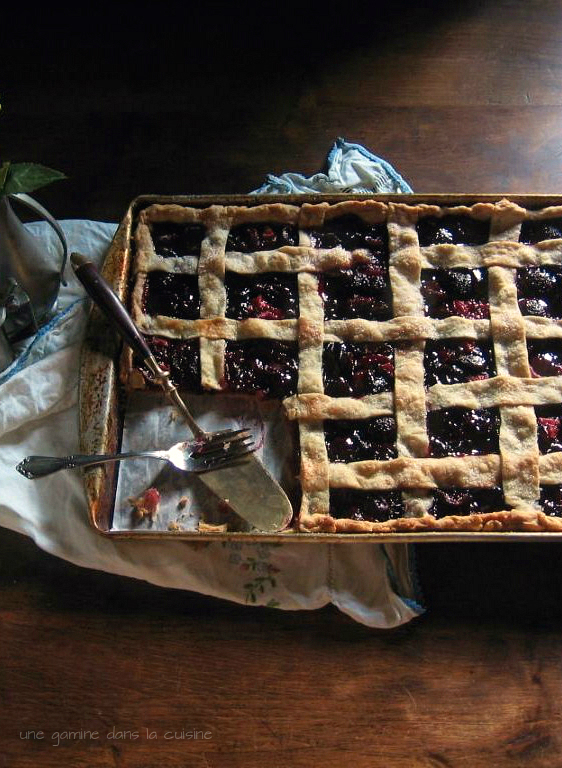 Your pie is gorgeous and smart idea to add the lackluster strawberries! I have seen these slab pies around. They are perfect for sharing the goodness with a crowd. What a beautiful pie! It's gorgeous. Anyway, I'll stop whining. Love your pie! If it tastes as good as it looks, I am in. I've been wanting to make a slab pie for a while now. Your right about how fast Summer seems to be slipping by us. Your pie looks delish, wishing I had a big slab of it right about now. Gorgeous slab pie, Valerie. The lighting on your images is just beautiful. BTW, not sure if I mentioned it earlier but really like the design of your blog! 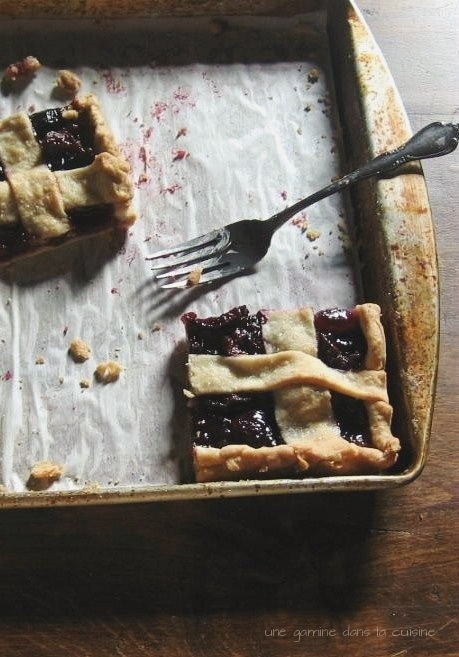 How great is the idea of putting on a baking sheet instead of a pie plate! Summer is going so fast, I can not believe that it is August this week! I don't quite understand how July is almost over! 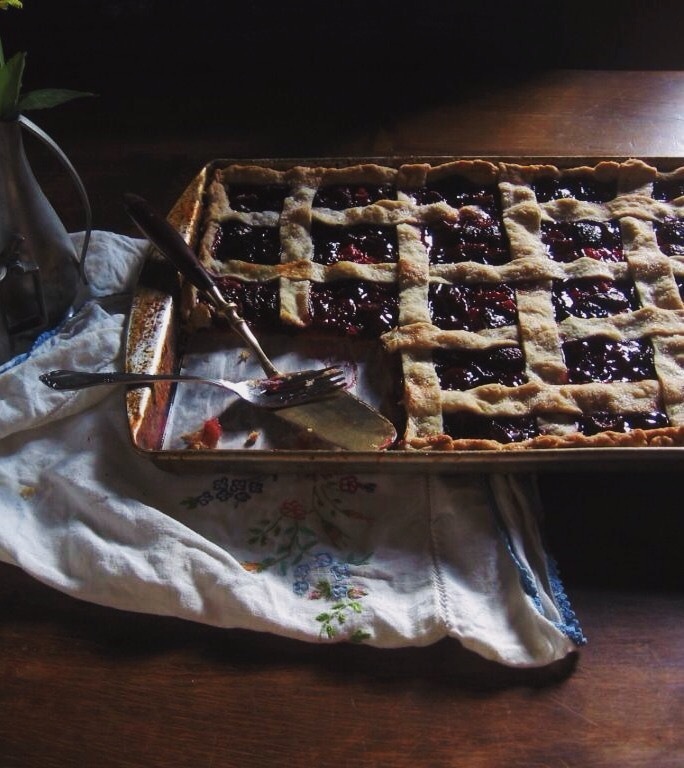 This pie is so rustic and so beautiful Valerie! Simply gorgeous! I saw this the other day, but haven't had a second to stop. Yes, where exactly did summer go? I'm going to make a version of this this weekend for a party, I like your lime twist, I don't know if I want to do the lattice or cover the whole thing, but I will let you know. Have a great weekend. I love everything about this, it looks like it comes from a quaint, gourmet bakery somewhere in the hills of Italy! oh how lovely this is! a pie but rectangle. and like you, i am mourning the speed summer is passing us by.